You can have your ad here, too! Click here for complete information on the most economical way to reach tens of thousands of Northeast radio and TV people each week. *There was a time when radio stations prided themselves on stability and consistency, celebrating decades of history and heritage call letters. Today, at least in upstate NEW YORK, it seems that the thing to be is "Fickle." 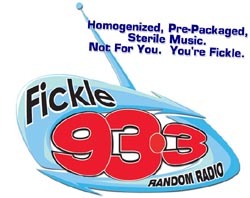 In any case, that's the new nickname for the Entercom station formerly known as oldies WBBF-FM (93.3 Fairport), which flipped Thursday morning (Apr. 7) to a "random" mix of classic hits and hot AC tunes that sounds awfully similar to all those "Jack" stations and their clones from coast to coast, albeit developed locally by operations manager Dave Symonds and GM Mike Doyle. WBBF's "Ace and Marti" morning show continue, but the station's running automated the rest of the day, at least for the moment. And as of this morning, the heritage WBBF calls (which have been in the market since 1953, most of that time on the sister facility at 950 now known as WROC) have been replaced on 93.3 by "WFKL." *Meanwhile at the other end of the Empire State, WXRK (92.3 New York) is still "K-Rock" - but as of last Monday morning, it's traded in the alternative rock it's been playing since 1996 for a broader rock format that includes older artists such as Motley Crue, calling itself "K-Rock. Great Rock. Period." The new (or perhaps "the new old") K-Rock ran jockless all last week (with the exception, of course, of Howard Stern in morning drive), but the jocks will be back this week, we hear. The modern rock lives on as a webstream called "Krock2." In Binghamton, Kirsten Van Slyke leaves WICZ-TV (Channel 40), where she's been a reporter, to take Jeff Steele's slot in morning drive on WWYL (104.1 Chenango Bridge), alongside morning host Riley. The FCC has rescinded its grants of two new Binghamton-area LPFMs on 95.7. Living Water Ministries was granted a Binghamton CP, while Latter Rain Network was granted 95.7 in Sanitaria Springs - but each would have had four years of an eight-year, nonrenewable license term. The two applicants say they didn't have a chance to work out a share-time agreement for the frequency that would have allowed them to get renewable licenses, so they're asking the FCC for another chance. In Elmira, J.J. Morgan's leaving the OM/PD/morning host gig at Backyard Broadcasting's WNKI (106.1 Corning), returning home to Wichita and a PD/mornings job at KFBZ (105.3 Haysville KS). And in Buffalo, WHTT (104.1) has a new lineup in the wake of Tom Shannon's retirement at the end of March. Harv Moore moves into afternoons, and that opens up the midday slot for the versatile Jim Pastrick, who'd been doing part-time air work there. Meanwhile, another great oldies jock is out of work in the Garden State. Don Tandler, "The Record Handler," had been spinning the tunes on Saturday nights at WKXW-FM (101.5 Trenton) for 14 years, but things had been changing at New Jersey 101.5. First the station changed his playlist, eliminating the older oldies and, in the process, Tandler's weekly homages to the old WABC - and now Tandler's out of the station completely. And WKMB (1070 Stirling) is back on the air after spending most of last week silent, due to a transmitter failure. *In PENNSYLVANIA, former WPLY (100.3 Media) morning team Preston and Steve spent the week in court, hoping to invalidate the non-compete deal that would keep their new employers, Greater Media's WMMR (93.3 Philadelphia) from putting them on the air until August. "Big Mack" is leaving afternoons at WRBT (94.9 Harrisburg) to go to the Lehigh Valley and afternoons at WLEV (100.7 Allentown). And over in western Pennsylvania, Lighthouse Christian Academy is selling silent WLOG (89.1 Markleysburg) to Edgewater Broadcasting, for $10,000. And the FCC has granted a construction permit to Iorio Communications for the 102.7 in Clarendon that it won at auction. *New signals could soon be on the air in CANADA, once the CRTC wraps up a hearing June 6 in Niagara Falls. On the TV side, TVN Niagara Inc. wants channel 22 in St. Catharines with 401 kW for a new independent station focusing on the Niagara region. On the radio side, there's a big fight over the 104.7 frequency in the Woodstock-Tillsonburg area. In Tillsonburg, CKOT (1510), the last remaining daytime-only Canadian AM, is trying again to move to FM, asking for 2.3 kW for a country format. Over in Woodstock, competing applicants for 104.7 include Byrnes Communications (1.9 kW, AC format), Standard Radio (2.63 kW, modern rock), CHUM Ltd. (3.2 kW, soft AC), Newcap (3.2 kW, "gold AC") and Sound of Faith Broadcasting (moving CJFH from 94.3 to 104.7 with 3.1 kW). Additional applications for new FM signals are in Halliburton (Halliburton Broadcasting, 93.5, 6 kW), Pembroke (My Broadcasting, 104.9, 1.62 kW, apparently to operate in conjunction with CHMY 96.1 Renfrew) and Wasaga Beach (Bayshore Broadcasting, 97.7, 1.8 kW). There are new FMs on the air now, too: CKDO-FM-1 Whitby, on 107.7, relaying CKDO 1350 Oshawa, and CKQB-FM-1 Pembroke, on 99.7, relaying CKQB 106.9 Ottawa. *In VERMONT, Nassau is trying again to move WWOD (104.3 Hartford) across the state to the Burlington market from its present home in the Upper Valley. Previous owner Vox had applied a couple of years ago to move the 104.3C3 allocation from Hartford to Keeseville, N.Y., across Lake Champlain from Burlington - but the move was quashed when a competing proposal offered 94.1A as a brand-new channel at Keeseville, while leaving 104.3 at Hartford. Up north, the FCC denies Barry Lunderville's petitions to deny against new translator CPs granted to sister companies Edgewater Broadcasting (95.3 Littleton) and Radio Assist Ministry (106.7 Berlin). *It took ten years, but CanXus Broadcasting finally has a construction permit for a new class A signal on 98.1 in Van Buren, MAINE. The new signal will run 6 kW from 27 meters above average terrain, up there between Presque Isle and Madawaska. *RHODE ISLAND will continue to have public radio service on WRNI (1290 Providence) and WXNI (1230 Westerly). Boston University's WBUR announced late last week that it's officially dropping any thought of selling the two stations, ending a saga that started last fall and helped to bring about the downfall of longtime WBUR station manager Jane Christo. BU is reportedly talking to Bryant University about helping it manage the Rhode Island stations. We're pleased to report that Jim Taricani is once again a free man. The WJAR (Channel 10) reporter served four months of his six-month house arrest for refusing to disclose the source of tapes that helped uncover a City Hall scandal. A judge reduced the sentence by two months for good behavior - and Taricani will be back on the job at Channel 10 on Wednesday. Congratulations to Keri Rodrigues, who's just joined the morning team at WWBB (101.5 Providence); she'll continue doing news on sister station WHJJ (920) as well. And former WWBB jock Bruce Palmer has a new full-time gig - he's now doing 1-4 PM weekdays on WSRS (96.1 Worcester MA). *Finally, this scheduling note: we'll be on the road at the NAB convention in Las Vegas next week, so expect a reduced or delayed NERW on April 18. We'll be back on our regular schedule April 25 - and if you'll be out in Vegas, do say hello! *Our special clearance pricing continues for fans of the Tower Site Calendar 2005. We're well aware that many of the calendar's fans buy it for the pictures, not the actual calendar pages...but that doesn't change the fact that by this time of the year, we're not exactly shipping 'em out the door at a breakneck pace, and Mrs. NERW would very much like a corner of her living room back. So while she rediscovers the floor beneath those boxes of calendars and we begin to line up the images for Tower Site Calendar 2006, you get the very first crack at our Calendar Clearance Deal for 2005. Maybe you've already hung your original 2005 calendar on the wall, and you're thinking it would be nice to have another copy to stick away in pristine condition. Maybe you really want to frame that spectacular September page right now - but you still need a calendar later this year. Maybe you just want to help Mrs. NERW clean out the living room and give happy NERW baby Ariel more space to practice walking. And as always, the calendar's free with your $60 or higher subscription to NorthEast Radio Watch/fybush.com. In fact, we've got a great deal for new or renewing $60 subscribers: we'll send you two 2005 calendars if you subscribe now. Or, if you'd prefer, we'll hold a brand-new Tower Site Calendar 2006 for you with your subscription, and you can be among the very first to see the 2006 edition when it's released this summer. Remember, we count on your subscription dollars to keep NERW coming each and every Monday morning! NorthEast Radio Watch is made possible by the generous contributions of our regular readers. If you enjoy NERW, please click here to learn how you can help make continued publication possible. NERW is copyright 2005 by Scott Fybush.